This last week exposed new depths of talent which, to me and my family, were hitherto unknown. 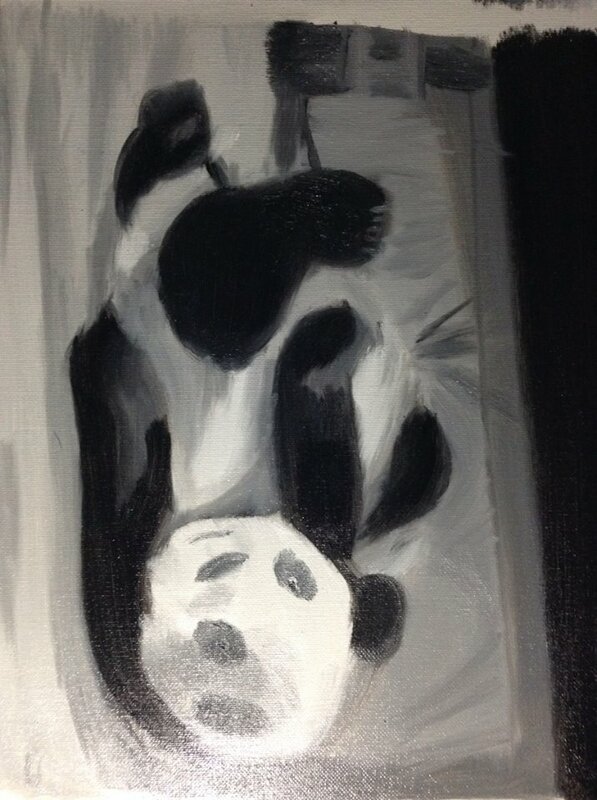 Namely: I painted a panda. For most artists, this is no great feat. For me, it was the height of creative achievement… largely because I had no idea that I was painting a panda at the time. It had begun with my instructor handing me a visual aid containing an abstract grouping of streaks and blotches in varying shades of gray. The piece, she informed us, was entitled “The Birth of a Planet” and, despite my best attempts, I failed to see anything resembling a planet in the painting. Still, I’d never painted with oils (or anything else) before, so who was I to question an expert? I set to work, filling in broad sections of the canvass with the proper paints, working hard not to apply any of them so thickly as to leave a textured look. According to my teacher, the great artists painted initial vistas exclusively in earth tones, using paints they’d mixed themselves from the local soil, before applying far more expensive colored pigments. Once we had finished, she moved between the pictures, examining each one, then instructed us to please turn our artwork onto its side. “What do you see?” she asked, carefully daubing black eyes, a nose, and an extra ear onto the work of one of the students. My heart leapt inside me; It was a panda! I had painted a panda! (And a pretty cute one too!) Grabbing a tiny brush, I followed suit, adding in the real details down to the nails on the panda’s toes and the whites of his eyes. Of course, this was all that my family, friends, classmates, coworkers, and passing strangers heard about all week. Partly, of course, because I was pleased to discover that my father’s repeated repossession of my crayons had not actually played any role in inhibiting my artistic opportunities and partly because I was so tickled at having actually painted something that looked identifiable. At the same time, I couldn’t quite get past the lesson to be learned: in life, just as in art class, we can’t always see what we are creating. The strokes and colors don’t always make sense to us and we aren’t guaranteed to like the half-painted picture on our canvass. In fact, we may even be tempted to give up in frustration! But just because we don’t see where we’re headed, doesn’t mean we should lose hope. If we trust the Master Artist, the end result will be far more than we could ever hope or imagine! If you want proof, just ask to see my panda! I’ve always dreamt of being an artist, but my attempts at portraying what I see (either physically or in my mind) have always come up just a little short. I attribute this largely to my father who squelched my artistic tendencies while still in their infancy. Apparently, he felt my repeated use of the wall as my canvas was sufficient cause for repossessing my crayons. Repeatedly. I was in grade-school at the time of the last repossession and, with a sense of martyrdom, resigned myself to the fact that I would never be a truly great artist. I would have to look elsewhere for purpose and fulfillment. And I did. Just recently, however, I was perusing a catalogue of the enrichment classes offered by a local college and found “An Introduction to Oil Painting” among them. A friend of mine (whose artwork is nothing to be sneezed at) had suggested oils as an excellent medium for experimentation. “They’re very forgiving,” he had explained. “You’ll probably discover that you’ll like it.” After some contemplation (which involved asking just how likely my father would be to repossess any of my oil paints), I decided to invite my sister to join me in taking the class. Our first lesson was basic: we discussed “values”. These are essentially the different tones which can be achieved when paints are mixed, in our case “Titanium White” and “Ivory Black”. Our instructor (who was trained by a friend of Norman Rockwell’s) walked us through oiling up our canvasses in order to ensure that the paints could be smoothly applied. She then carefully explained the proper process for mixing colors on our palette. (Lightest colors are mixed first, always starting with the lighter color as the base and adding in small quantities of the darker pigment until the desired “value” has been achieved.) She followed this by handing each of us a “visual aid” – a sad looking black and white abstract which she had dubbed “Birth of a Planet”. I admit to being a bit disappointed. I’m not a huge fan of abstract art and, in my heart of hearts, what I really wanted was a piece that I would be proud(ish) to hang on my wall. Instead, I was going to test my limited artistic skill on a 12×16 canvass that would find its way into the back of my closet, buried under other unwanted bits of stuff. The purpose, according to our instructor, was to keep us focused on form and technique rather than upon recreating an exact representation of an actual object. So I decided to go with the flow and give it a try… (to be continued).